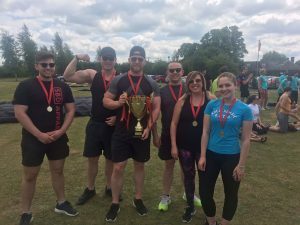 As part of our ongoing support for the Cambridge Roar, we entered a team in the first of their twelve events – The Corporate Games – for an action-packed morning of team building activities. With the sun blazing, our gym kits and sun cream on, plenty of water to keep us hydrated and our eyes on the prize – a giant golden coloured trophy – we were ready to compete! The morning saw a total of nine teams such as Arthur Rank Hospice Charity, East Anglian Air Ambulance and Cambridge News compete against one another in six different challenges which were F1 Pit Stop Challenge, Lazer Clay Pidgeon Shooting, a Zorb Relay, a Sprint Tunnel, Segeways and Little Landies. Each event was so much fun and thankfully not based on how quick you could do the challenges. It really was all about working as a team which we did splendidly with lots of giggles along the way. In second place was Quy Mill Hotel and in first place was… Media Managers! We were all ecstatic to be crowned the overall winners. Not only did we get this pretty impressive trophy which is now taking pride of place in the boardroom but we were all given individual medals and made the Cambridge News the following day. If you didn’t manage to come along to this year’s event, we highly recommend giving it a go next year. It’s a really fun day for the whole team to get involved with and it’s good to know you’re doing your bit for worthwhile charities. 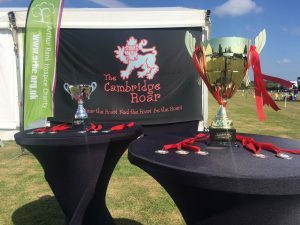 If you can’t wait for next year’s event then there are still some other Cambridge Roar events to attend for the next few months. Take a look here. By Ellie Banahan| 2017-07-04T10:25:20+00:00	July 4th, 2017|Uncategorized|Comments Off on We are the champions!